I'm the stinky kid in class. No, really. I know it's an over-share, but as it pertains to the performance of this base layer, it's probably key that I tell you that now. For me, on long trips, fresh clothes can be a far-fetched dream, and putting on clothes that smell even remotely decent is unlikely at best. Duckworth claims the 100 percent Helle Rambouillet merino wool used to make the Maverick is stink resistant, so I put it to the test during 14 days straight of serious sweating to find out for myself. 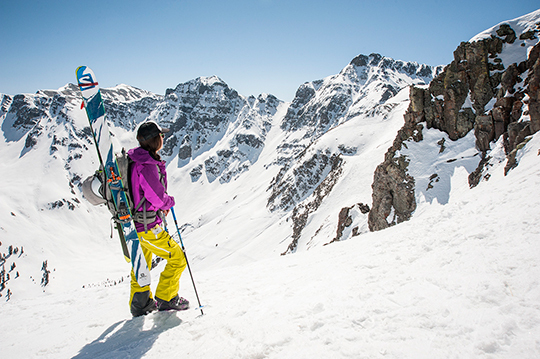 I constantly sniffed myself in an oh-so-unladylike way as I climbed, hiked and skied my way through Colorado. I'd catch a brief whiff of unpleasant body odor here and there at the peak of my exertion, but by the time I'd stopped sweating the stench—along with any moisture that had accumulated—dissipated from the base layer. After ten days of sweating and ten mornings of putting on the same dirty shirt that (I couldn't believe) didn't smell like a locker room, I was starting to become a believer. But before I donated all my synthetic base layers to Goodwill, I wanted to put the soft, jersey-like Maverick through the sweatiest test I could think of: Boulder's Alpine Training Center. Geared toward preparing mountain athletes for the rigors of big-mountain adventure, it's the hardest workout I've encountered in nearly 20 years of training—which means more sweat in an hour than I'd likely ever muster on my own. Between racing fellow athletes on airdyne sprints, burpee box jumps, sandbag get-ups, and renegade man makers a thorough sweat is a constant guarantee. After this workout, the Maverick's naturally stretchy and lightweight Power Jersey 160 fabric (made from natural Montana wool) finally started to stink. Just to be clear, I, too, reeked, but the shirt itself had—up until this point—managed to rid itself of said stench every time I took it off with just a few hours. To be certain that my nose was on par with the good, bad and ugly of this unlaundered and adventure-soaked shirt, I made sure to confirm with a few unsuspecting friends that it did indeed stink (it did, and they might never forgive me). The next morning, after it sat in a pile of dirty clothes on my floor, friends again helped confirm that the Maverick had rendered itself stink-free once again, and I was officially sold. While trying, and failing, to make the Maverick retain body odor, I became hooked on some of its other features. On all of my adventures, Colorado's quick-to-change weather meant versatility in a layering system was clutch. At times, I'd find myself sweating profusely—to the extent where I worried about getting a chill from which I might not recover when stopping on a windy summit in just a base layer and shell. In each instance, by the time I'd stopped to briefly appreciate the view and then taken off my pack to dig for a puffy, I'd find that any moisture that had built up (mainly on my back where my pack made contact) had dissipated enough so that the Maverick was able to transition from being a breathable next-to-skin layer to more of a warming layer. The versatility of the Maverick played a key role while hiking (a.k.a. sweating) uphill and making my way along a knife edge in Summit County, where winds picked up to near 35 mph, leaving little option other than getting low and waiting it out. Taking extra layers out of a pack at that point meant you risked half your gear flying away, so the Maverick's features were crucial to staying warm. The snug-fitting hood (perfect for under a hat or helmet) with a zipper that comes all the way up to your chin, thumb loops to pull sleeves over your wrists and a slightly longer back side all help keep body heat in when weather turns chilly. With no snags, tears or inconsistencies in the material after abusing for 14 days, the durability ranks on the high end of the spectrum—though there was just a hint of some pilling in the high traction underarm area. At $120, the true-fitting Maverick falls into the high end of pricing on base layers, but based on the fact that you'll essentially never need to spend time, money or energy washing it, the value is inherent. That said, washing the Maverick is painless. Just pop it in with your machine on gentle and dry flat or on a line.